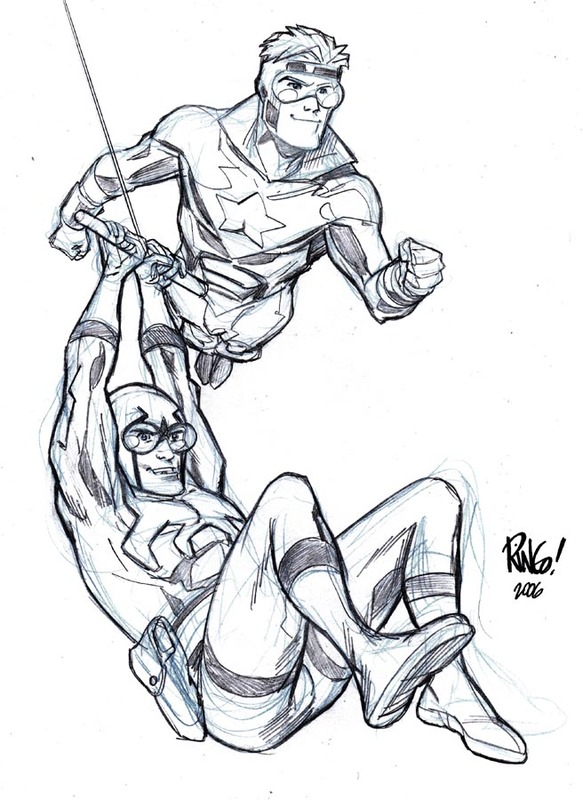 August 2006 - The Official Webpage of Mike Wieringo! 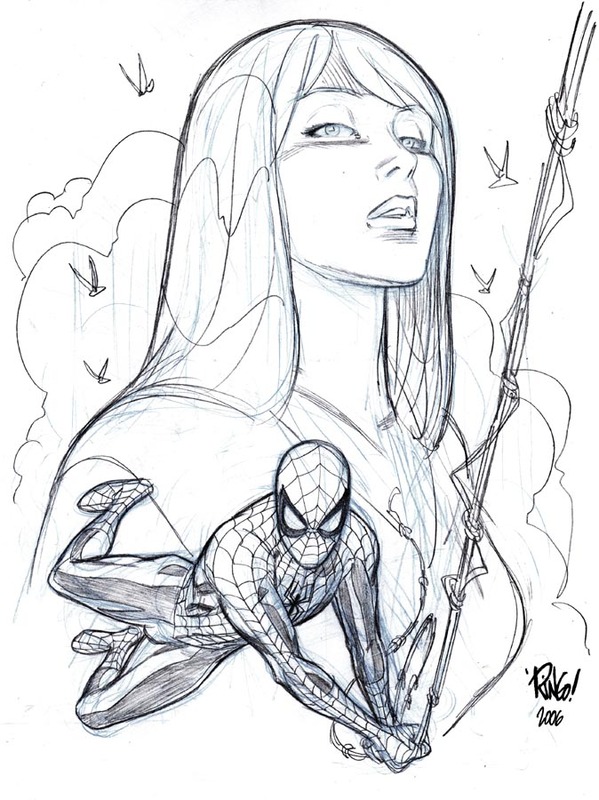 archive ¦ The Official Webpage of Mike Wieringo! One of the greatest things about getting to work with Todd Dezago on SENSATIONAL SPIDER-MAN (besides the fact that I got to work with Todd– and I got to draw SPIDER-MAN, for gosh sakes…) was that the editor, Ralph Macchio, allowed us to do whatever kinds of stories that we wanted to do. Other than the occasional crossover (and I think there were several of them during our run)– we were left to our own desires as far as story content went. And Todd was incredibly generous in allowing me to ask for whatever kinds of stories or guest stars I wanted to draw at any time. I simply had to ask for something, and Todd made it happen. 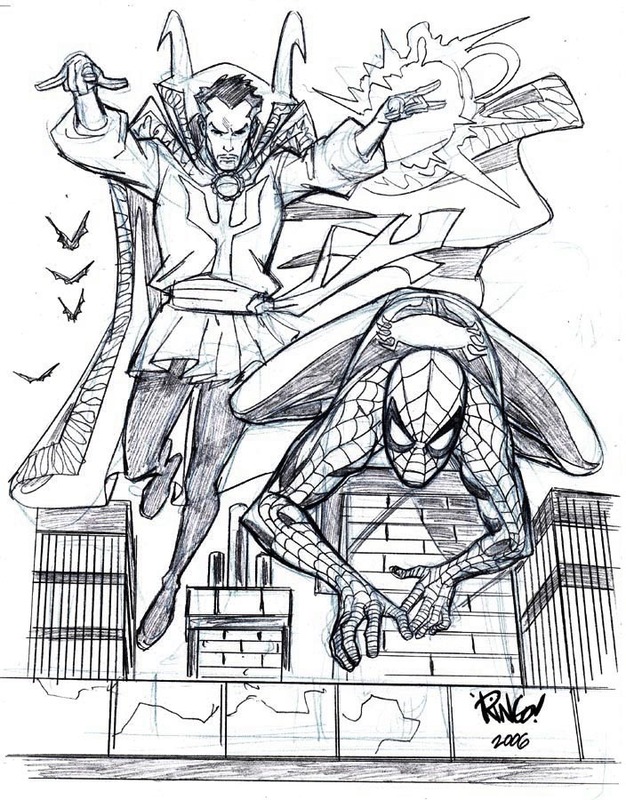 As I’ve mentioned in the past, Todd and I both enjoy tales of fantasy and magic– and for one story arc, we decided that it would be fun to team SPIDER-MAN up with DOCTOR STRANGE– a character I’ve always had a soft spot for since I was a kid– in a story arc that pitted them against an other-dimensional sorcerer and gremlin-Lord named Buel. He was on a quest to grab a magical talisman called the Sphere of Sara-Kath from the Technomancer Corporation. This corporation was dedicated to using arcane artifacts of magic and the occult to give them a leg up in the business world. Unfortunately for them, the Sphere opened up a rift to Buel’s dimension, allowing him to enter ours and wreak havoc. This story arc was a blast to draw. It had everything that someone who loves to draw a fantasy and SPIDER-MAN mash-up could want: DOCTOR STRANGE, an evil other-dimensional Goblin-Lord, tons of little goblins, a huge ogre– and coolest of all, the chance to send SPIDER-MAN dimension hopping. 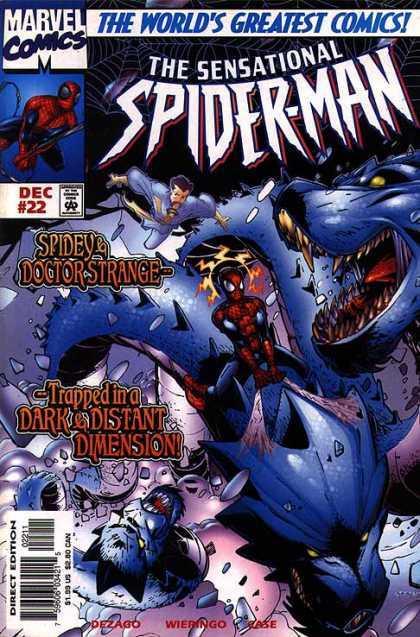 Only in SENSATIONAL SPIDER-MAN could you see the main character riding a giant ice serpent…..
≡ R.I.P. Mary Jane Watson Parker…? The first rumor item over at ALL THE RAGE. features what is purported to be a leaked image that hints (OK…. it’s more like a sledgehammer than a hint) at the imminent death of Peter Parker’s wife Mary Jane. Joe Quesada’s hinted at this for quite some time in his CUP O’ JOE answer columns at NEWSARAMA… and the MJ boosters have been buzzing with anticipated anger at this possibility. Personally, I don’t have a very strong opinion one way or the other– but her dying makes a kind of sense to me in the context of the essence of SPIDER-MAN’s character. Peter was thrust into the role of hero out of the tragedy of his Uncle Ben’s death– and the core of what has always made SPIDER-MAN such a wonderful character that so many people have been able to connect to is the idea that although he has these amazing powers, his life was always a mess. And what long-time SPIDER-MAN fan doesn’t remember the death of Gwen Stacey and the impact it had on not only the character of Peter/SPIDER-MAN–but we fans as well. Tragedy, loss, yearning and the struggle to make a happy life from seeming roadblocks at every turn has always been a hallmark of SPIDER-MAN…. and maybe this– if it’s actually going to happen– will return him to that. He’s been sort of in a holding pattern– kind of on cruise control– for some time now. Perhaps it’s time for a shake-up. What do you folks think….? Posted in Uncategorized | Comments Off on R.I.P. Mary Jane Watson Parker…? I’ve been reading comics for such a long time now– about 32 years– that while I don’t outright forget some of the wonderful periods of ‘4-color’ excitement I’ve witnessed over the years…. I can tend to overlook them at times. When I posted my R.I.P. to BOOSTER GOLD on Monday, I called him an unnecessary character… and that rubbed a couple people the wrong way. I was reminded of the wonderful so-called ‘BWAHAHA’ period of the JUSTICE LEAGUE written by Giffen and DeMatteis and beautifully drawn by Kevin Maguire and then Adam Hughes. Those were wonderful times for that comic… at a time when DARK KNIGHT and WATCHMEN had inspired comics to follow in their dark path as far as tone… JUSTICE LEAGUE was a breath of fresh air with it’s terrific mix of humor and high action. It’s important to remember that though the book has the reputation as a ‘funny’ book… and it was…. there was also some real peril to the LEAGUE involved. I remember their confrontation with DESPERO that was absolutely horrifying. I also remember that Adam Hughes really came into his own as one of the premiere artists in comics on the book. As great as Kevin Maguire’s work was on the book… and it was spectacular… there was something magical about the combination of the kind of stories that Giffen and DeMatteis were writing in concert with Adam’s artwork. I still consider it one of the highest creative points of superhero comics. BOOSTER GOLD’S and BLUE BEETLE’S friendship was also a very special part of that book. Their interactions and buddy-relationship instantly connected with so many fans– and the calls for a ‘BLUE AND GOLD’ ongoing series for the two of them began almost immediately. I don’t know why it never happened… but I think it came close to becoming a reality a time or two. Who knows…. maybe too much of a good thing would have been a bad idea and it’s better that it never came to pass. We’ll never know… but remembering those JLA days now– I have to retract my Monday statement. BOOSTER was absolutely not an unnecessary character. So for BOOSTER and BEETLE, I dedicate today’s sketch. 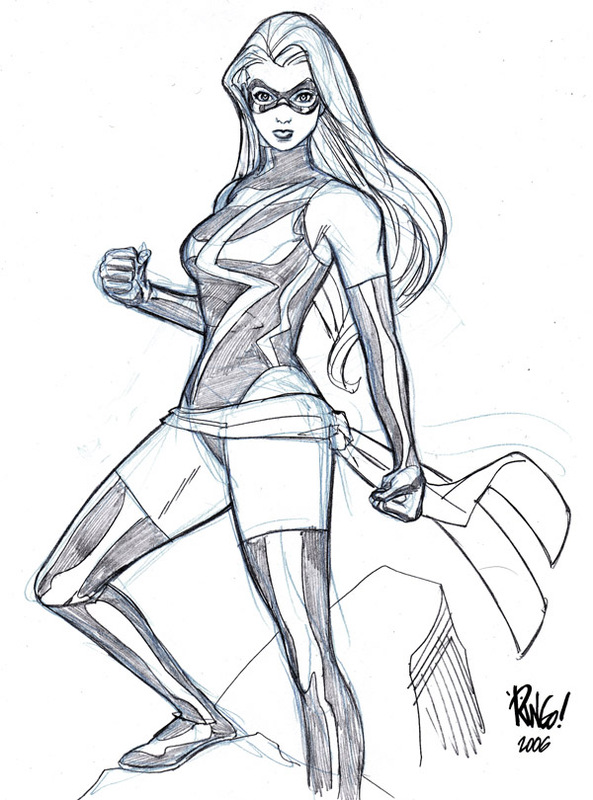 Since Marvel has released its November solicitations online at this point– for those of you who might not have seen them, I can say now that I’m going to be drawing two issues of MS. MARVEL. Specifically issues 9 and 10. Back in the 70’s (dating myself), I was a huge fan of CAPTAIN MARVEL (both of them, really.. but I’m talking about the Marvel version here)– and when Marvel debuted the MS. MARVEL comic, I was an immediate fan. Although I wasn’t all that keen on her first costume based on her male counterpart’s– only with a scarf thrown in for good measure– I still thought she was a fun character. But when Dave Cockrum came on board as penciler with issue 20 and redesigned her costume into the sleek version she wears to this day, I was REALLY hooked. So hopefully it will be fun to draw a couple issues of her new adventures. It’s always neat to be able to draw a character I was into as a kid. I’ve got three covers coming out the month of November. 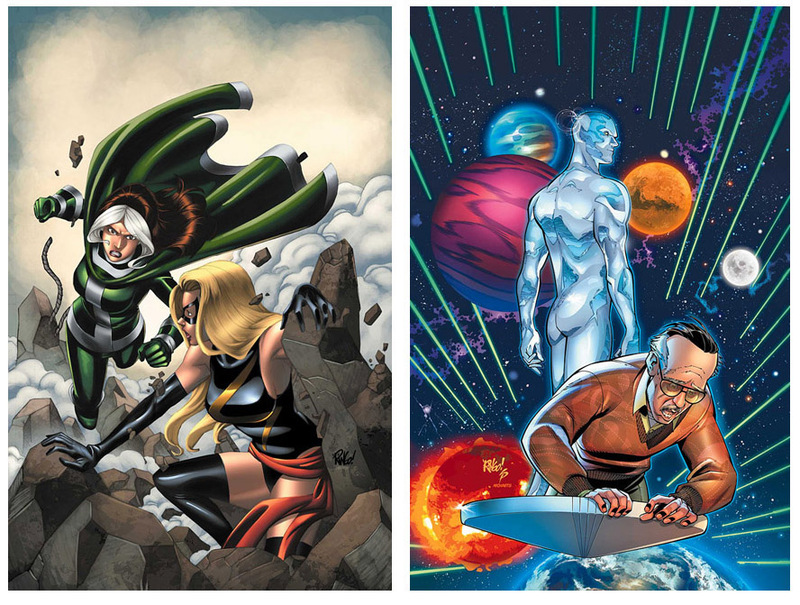 One for the MS. MARVEL book… as well as one for STAN LEE MEETS THE SILVER SURFER. I got to draw a 10 page story plotted by ‘The Man’ himself… and it was fun to get a chance to draw the SILVER SURFER– another character I’ve never had the chance to draw (except for a flashback panel here or there) before. Finally, I’m doing covers for an M2 UNIVERSE mini series called AVENGERS NEXT. I’ve posted all three covers here for you to see, if you haven’t already. ≡ Alas, poor BOOSTER– we knew ye well…. The carnage continues, it seems, over at DC, with the death of BOOSTER GOLD in the latest issue of 52. I’m beginning to think that ‘DC’ should start standing for ‘DEATH COMICS’. That’s a little harsh, I know. Both DC and Marvel make a regular habit of killing characters these days– and for all I know, there will be a new person stepping in to become a new BOOSTER and launch a new series, like they’ve done with BLUE BEETLE. Hmmm…. there’s someone high up at DC who’s got something against the color blue, maybe…? I have a small piece of history with BOOSTER GOLD myself. 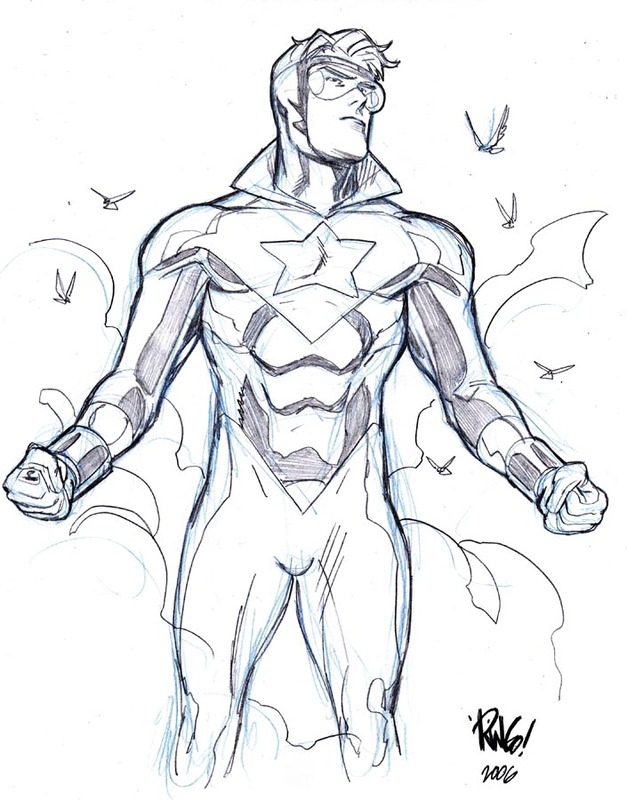 Back in — I think– 1994, Brian Augustyn– then editor of FLASH, JUSTICE LEAGUE and more at DC– asked me to come up with a new design for BOOSTER’S costume. He wanted something more mech-like…. something more high-tech. What I came up with was eventually voted (if memory serves me well) as one of the 10 WORST COSTUMES EVER DESIGNED by the editors of WIZARD MAGAZINE…. and rightly so. I suppose that long awaited BLUE AND GOLD series starring BLUE BEETLE and BOOSTER GOLD in a ‘buddy film’ type comic will never happen now. Rest In Peace, BOOSTER. You were a fun, if rather unnecessary character. Posted in Uncategorized | Comments Off on Alas, poor BOOSTER– we knew ye well…. You are currently browsing the The Official Webpage of Mike Wieringo! weblog archives for August, 2006.